Swami and I have been hard at work all day. We started at noon and just finished, 10 hours later, sampling 24 entries in the flowers division of The Emerald Cup. There are 20 other categories in the cup this year, but 14 years ago it started with just the flowers. They remain the jewel of the competition. This year’s team of 15 carefully selected judges gathered Monday afternoon at Area 101, home of Healing Harvest Farms and The Emerald Cup family in Mendocino County. With only 10 days to sort through at least 400 samples of flowers, it is a tight schedule since time must be allowed for SC Labs to test every entry first. It’s worth the wait to know it is clean when we smoke it. Tim Blake, producer of The Emerald Cup, greeted the judges with open arms and that look of “Here we go again,” on his smiling face. 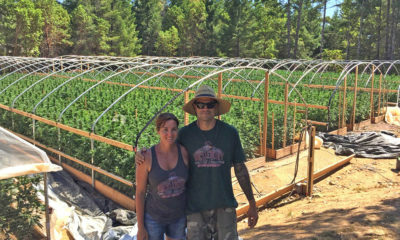 Yet each year has been distinctly different, as we have watched what was an intimate and primarily Emerald Triangle awards ceremony and harvest dance party blossom into a two-day event which draws over 30,000 from all over the world. It is the original organically and sungrown cannabis event and it all started as a pipe dream over the trimming table. Who says stoners don’t get things done? With flashlights, scopes and magnifying devices we dove into the field of mason jars on the table before us to sort out the quarter finalists. We judges devoted five solid hours to checking some of the best cannabis in the world with the scrutiny of a fine arts appraiser. That was just the first batch, and considering the high quality of the entries this year, it took some serious consideration. It’s a group process, done with real care and recognition of the labor and love put into growing each of those plants. We don’t want to miss a thing. We look closely, we breathe deeply, we feel the cure and check out the trim. When a potential contender is discovered, some judges will fill bowls for a quick taste while others roll joints to share with the group. Favorites are found, others are discarded as not having any notable terpenes or a rough trim job or a bad cure. For a bunch of people who love to get high, this is a very focused group. Each joint we pass has been carefully numbered so we don’t loose track. Let’s face it, we are all getting quite high during this process. But not so high we can’t tell the special girls who cut through and say, “Look at me!” Their terpenes, or fragrance, is what announces their charms first. A beautiful color and shape of the bud, sparkling crystalline structure and voluptuous trichomes will always entice an eager judge. We have been presented with a gourmet buffet and only care to pick out the crème de la crème. We are professional pot snobs and proud of it. After several hours we had a stash of about 69 jars on a side table, ready to go onto the next round the semi-finals. We divided them into three groups to send home with the judges, who likewise were divided into three groups. The busy crew then packaged them up into approximately one gram servings in plastic snap containers and everyone was given a bag with 23 samples. That’s actually quite a lot of homework, considering we only had one day to do it. Fellow longtime judge and friend Nick Smiglys came over to our ranch today to have a judging jam session. Together we sampled 19 of the 23, and Swami and I just finished up the rest. While people joke, hopefully, about offing the judges to get their positions, I remind them that it’s a serious fulltime job. The benefits may be great, no question about that, but it is a time consuming labor of love. It’s a smoking marathon. We’ll resumed Wednesday morning at 10:30 a.m. at Area 101, when another 300+ entries were ready for us to carefully scrutinize. Again, we will sort out the best of the best for the quarter-finals to deliver to the three judge groups. Today we reconvene, to decide the Top 50 or semi-finals. At that point, every judge is given a new sample of each of the Top 50 to take home and make their final decision about order of preference. The better the samples, the harder it is to decipher the winning subtle attributes because they are all so tasty! On Wednesday, Dec. 6 we will meet again, to carefully narrow it down to the final Top 20, in proper order. Somehow, every year we reach a decision that feels right to all. The cream truly does rise to the top. But the real icing is when we finally find out who the winners are and where they come from as we have had absolutely no idea during the judging process. On Sunday afternoon, Dec. 8, Swami and I will again proudly announce the Top 20 winners in the flowers division at The Emerald Cup in Santa Rosa — usually just around 4:20 p.m. It’s always great to hear the hollers from around the floor of the vast auditorium as we call a name. We just made someone very happy and they in turn had made us happy with their cannabis. It feels right to honor the farmers who have crafted such fine flowers through their wisdom and understanding of the plant. And now, after a full day of judging, we’ll smoke some of our own as a bedtime nightcap. A farmer always resonates and prefers his/her own homegrown cannabis. Plus, we can simply kick back and enjoy it. Even a connoisseur needs to take a break. TELL US, do you think you have the dedication necessary to judge a cannabis competition?